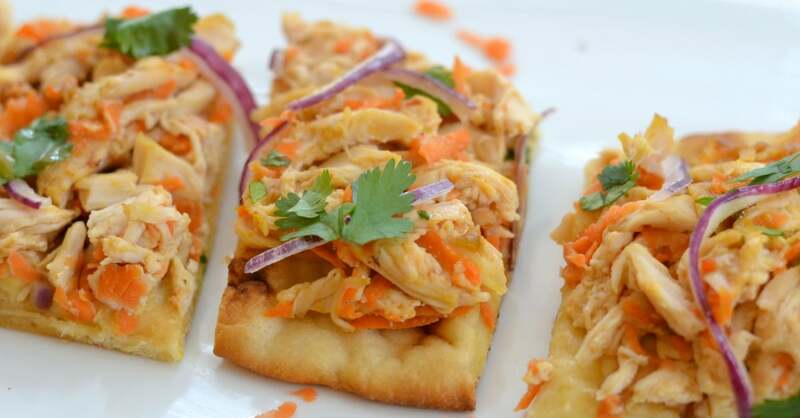 This Easy Thai Chicken Flatbread only requires 6 ingredients and comes together in minutes. Serve it at a party, make it for lunch, or pair it with a salad for a simple and delicious dinner. I love it, love it, LOVE it when other people make food for me. Not only is it nice to have a break from cooking once in a while, but I’m also super curious (nosy) when it comes to other people’s kitchens. I enjoy discovering new favorite dishes through friends and family members, and learning about the types of recipes and cuisines that others enjoy. I’m totally the annoying friend who’s always asking people what they’re making for dinner, what they ordered at the restaurant, and what they like to buy at the grocery store. 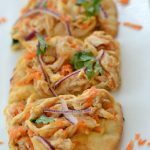 A few months ago, my friend and neighbor Kim whipped up a delicious Thai chicken flatbread to serve as an appetizer while we were over for a visit. When I saw how easy it was and tasted how delicious it was, I knew I needed to steal it for my blog. It’s taken me a while, but I finally made it and photographed it this morning so that I can share it with y’all. If it’s any indication how good it is, my daughters and I gobbled it all up the second I put my camera down. AND it was only 10:00 in the morning! Such are the perks of food blogging on a cloudy day during the holiday break. There are no rules about when, what, or how much we eat! 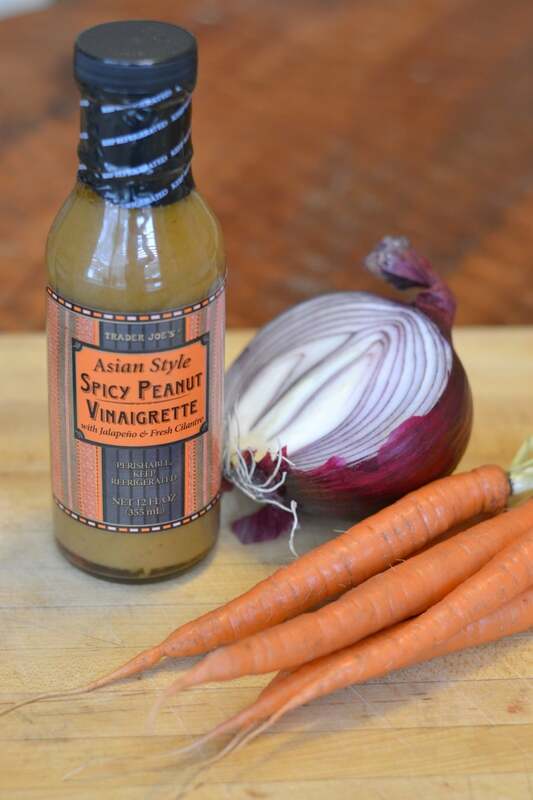 It’s not overly spicy, and it’s packed with delicious peanutty Thai flavor. If you don’t live near a Trader Joe’s, you should still be able to find a good dressing at any decent grocery chain. You can choose to cook the chicken yourself, or use a rotisserie chicken. I chose the latter, and the chicken I pulled from it amounted to 3 cups, which is why I based the recipe on that quantity. That should give you enough to make about three naan flatbreads. In the interest of time, you can also opt to buy pre-shredded carrots, although I personally prefer the taste and texture of freshly grated carrots. Just top the naan with the chicken mixture and red onion, pop it in the oven for about 5 minutes, and you’ve got yourself a tasty, fresh, and amazingly simple dish that tastes like it required WAY more work than it actually did. 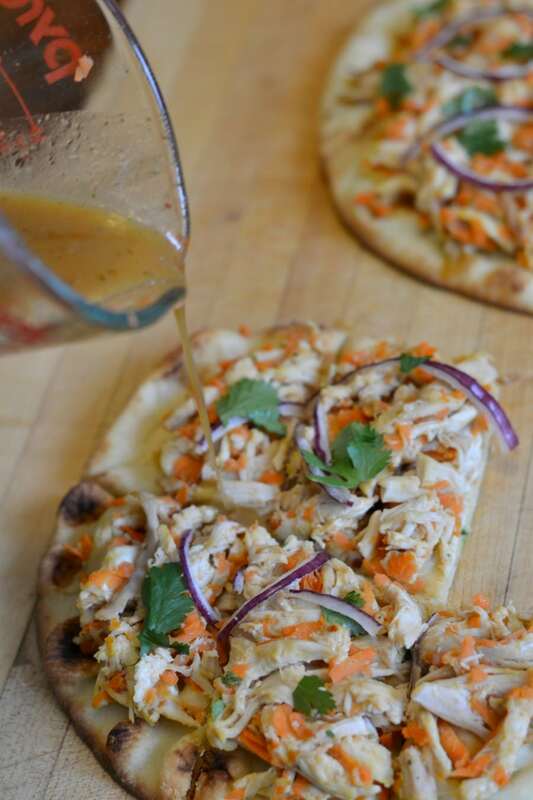 You only need 6 ingredients for this easy thai flatbread appetizer. In a bowl, combine shredded chicken, shredded carrot, and dressing. 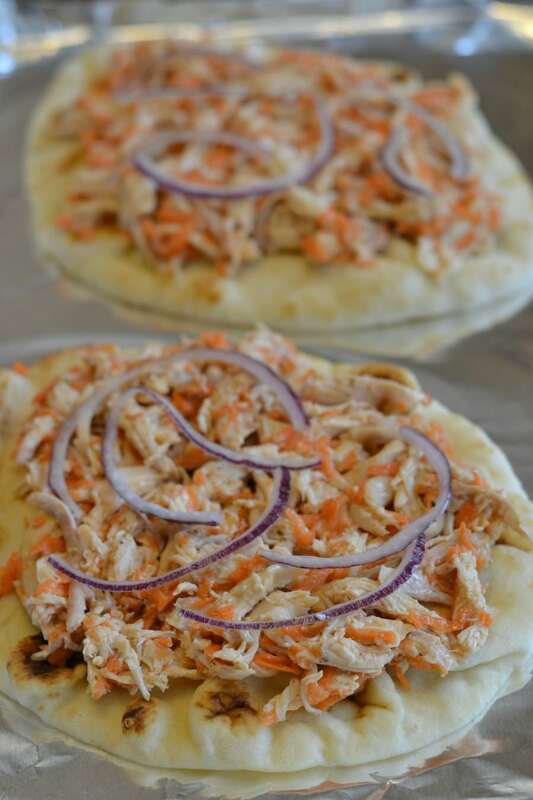 Distribute amongst the naan flatbread and top with thin slivers of red onion. 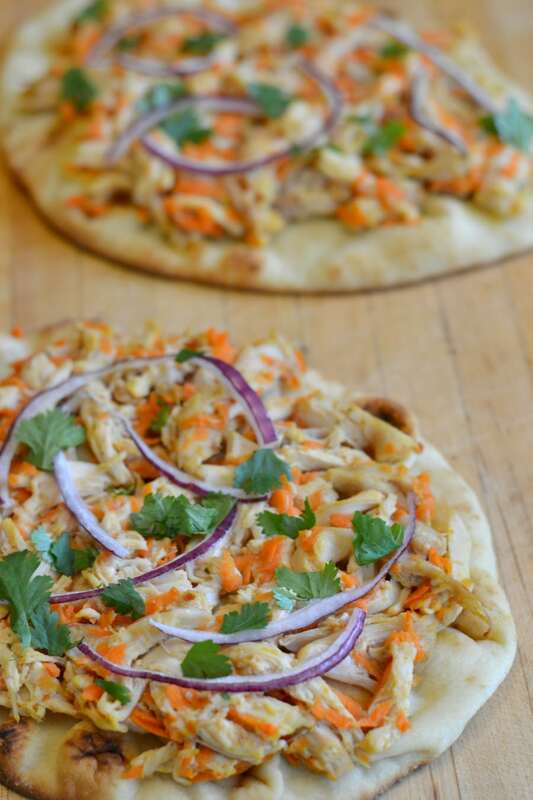 Bake for approximately 5 minutes, or until flatbread is crisp and chicken is hot. Lightly drizzle some additional dressing over the top of the cooked pizza, and sprinkle on cilantro leaves. These look SO good!! I’m going to use a ginger salad dressing, my son can’t eat peanuts. Sounds delicious! Will make soon.